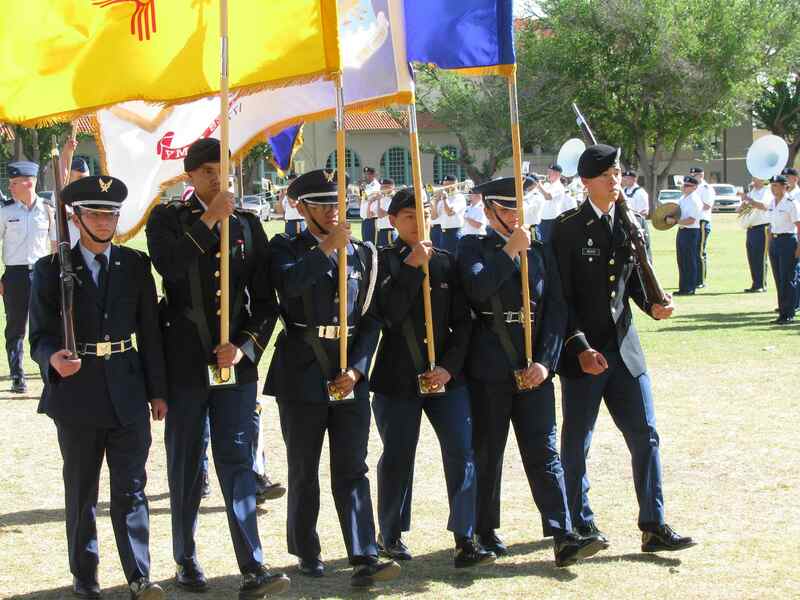 FASF Trustee, Colonel Cline’s Air Force ROTC Cadets joined forces with Colonel David McCoy’s NMSU Army ROTC Cadets to march in the 113th colorful annual President’s Day Parade at NMSU’s Hadley Field on the NMSU campus Horshoe Drive. FASF members Colonel Alan Fisher and Ric Lambart were invited to view the passing of the troops. The US Army Band from Ft. Bliss, El Paso, Texas, provided the marching cadence with their well performed martial music. Photos below are courtesy of NMSU Journalism student Rosemary Woller, the FASF Aerodrome Staff, and Col. Alan Fisher, long time FASF member. Above: Colonel Cline greets 1st honored guests to arrive early: L to R above: Col. Cline; Mrs. Baker, US Navy Captain Walter Baker, Ret. ; Mrs. Mary Reinhart, and Lt. Colonel James Harbison, US Army Ret. Getting ready to Review NMSU ROTC Cadets are, L to R: Ben Woods, President of the NMSU Aggie Development Corp and Assistant to the NMSU President; Lt. Col. David McCoy, US Army ROTC Commander; Lt. Col. Ira Cline, USAF, AFROTC Commander; Brigadier General Juan Griego, US Army, and Chief Sergeant Major, Lance Lehr, US Army. L to R above: In Red NMSU Jacket, Mr. Jay Rivera and his brother, Capt. 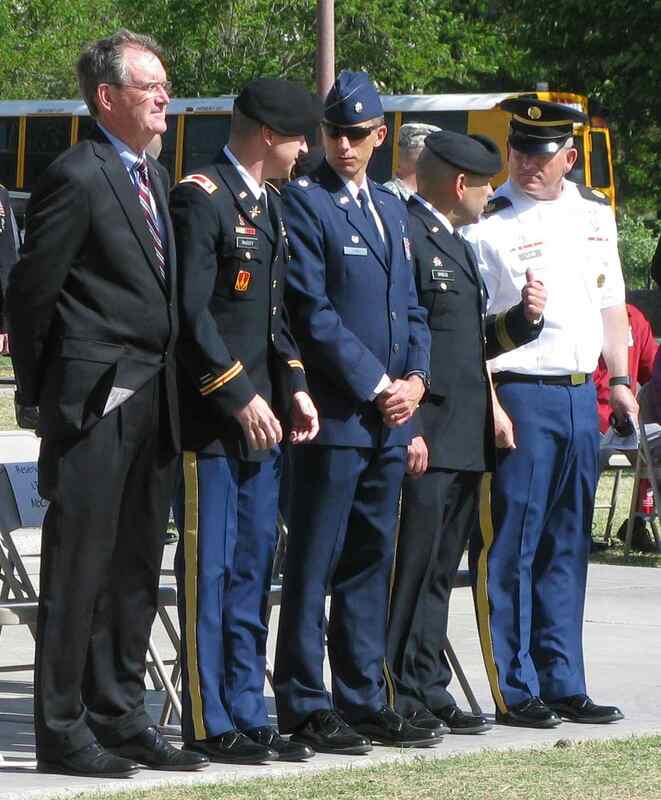 Joshua Rivera, (both on the Army ROTC’s Staff) with Cadets in Foreground: Army cadet LTC Jarred Green, AF Cadet Colonels Katie Armstrong, and Peter Smith, Army Cadet COL Tessa Thompson, and AF Cadet Lt. Col. Brad Ward. L to R inspecting the assembled Cadets are President Ben Woods, Colonel David McCoy, Colonel Ira Cline, and Army Cadet Colonel Tessa Thompson. Passing in Review are the combined ROTC Color Guard, with L to R above: AF Cadet Weston Stutzman; Army Cadet Sergeant First Class Brian Webb; AF Cadet Capt. 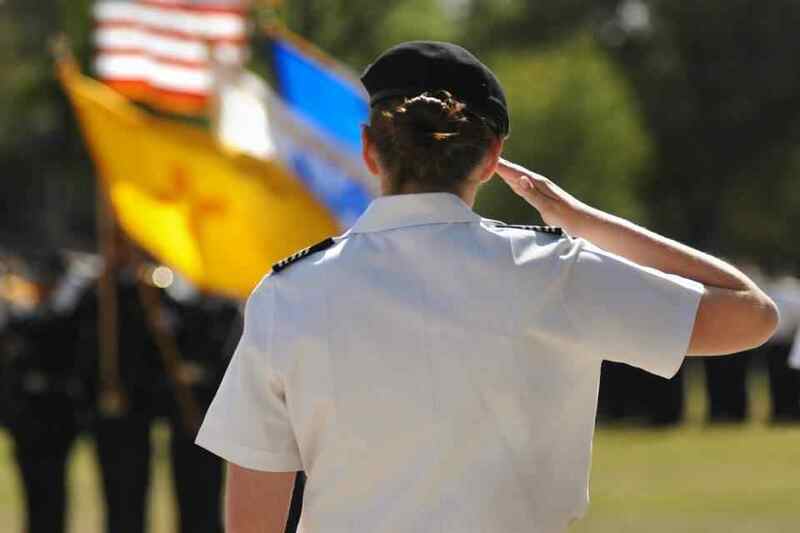 Victor Acosta; Army Cadet 2nd LT Krista Gatan, Air Force Cadet Angelica Helton; Army Cadet 2nd LT Richard Buck. 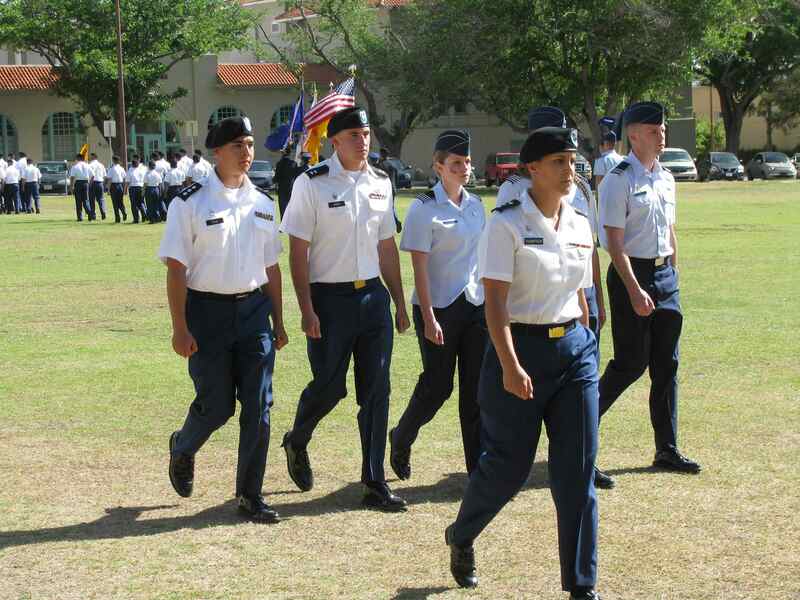 Leading the “Pass in Review” of all the ROTC units are the top Officer Cadets above, L to R: Army Cadet Capt. 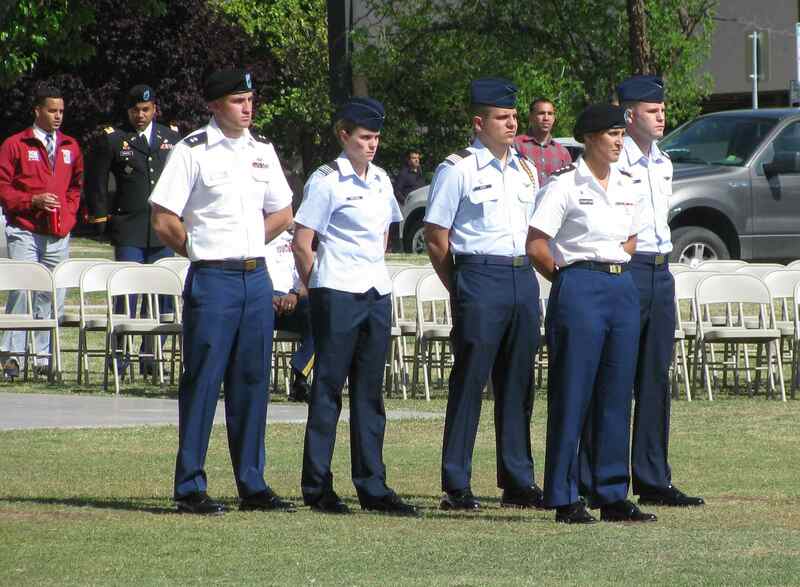 Eric Paul; Army Cadet LTC Jarred Green, Air Force Cadet Colonel Katie Armstrong; Army Cadet COL Tessa Thompson; Air Force Cadet Col. Peter Smith (hidden behind Cadet Thompson); and Air Force Cadet Col. Brad Ward. 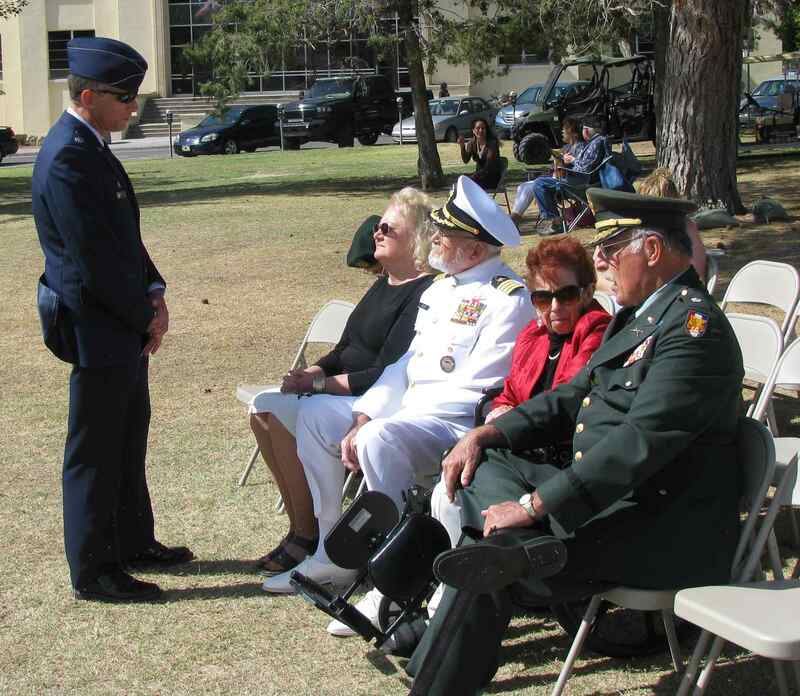 Our own FASF member, Colonel Alan Fisher, who was once the Commanding Officer of the NMSU AFROTC – and who actually pinned his new 2nd Lt. Bars on now Trustee Colonel Ira Cline’s uniform at his graduation from NMSU’s AFROTC many years ago, strikes a pose with his friend and honored guest at the President’s Review, Retired Navy Captain Walter Baker. 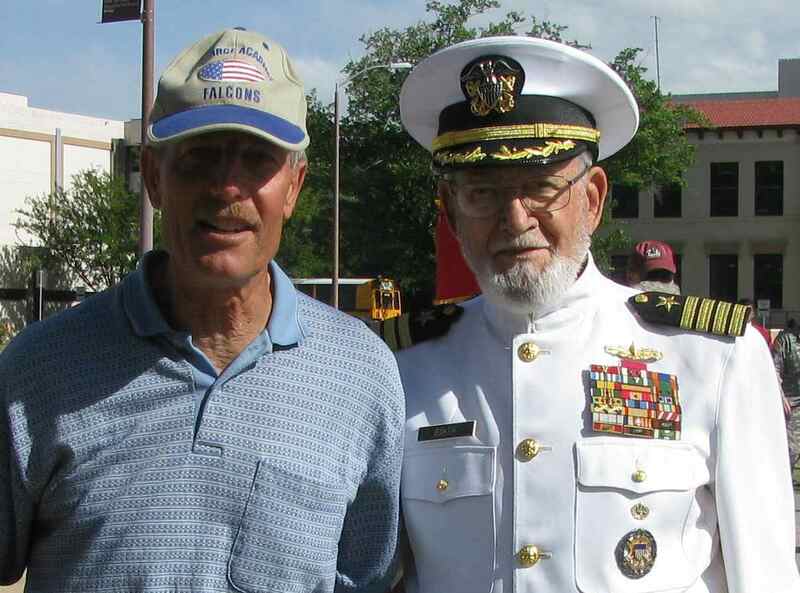 Not to lose out on the photo ops, Colonel Alan Fisher insisted on taking this shot (above) of FASF President Ric Lambart, after he had compared experiences with Capt. Baker about his own short 3 year career in the US. Navy. 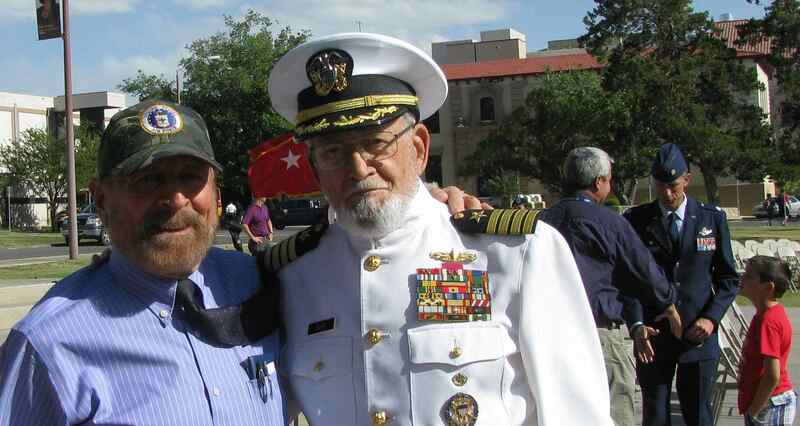 Colonel Cline is in background (R) with his young son, Nathan. 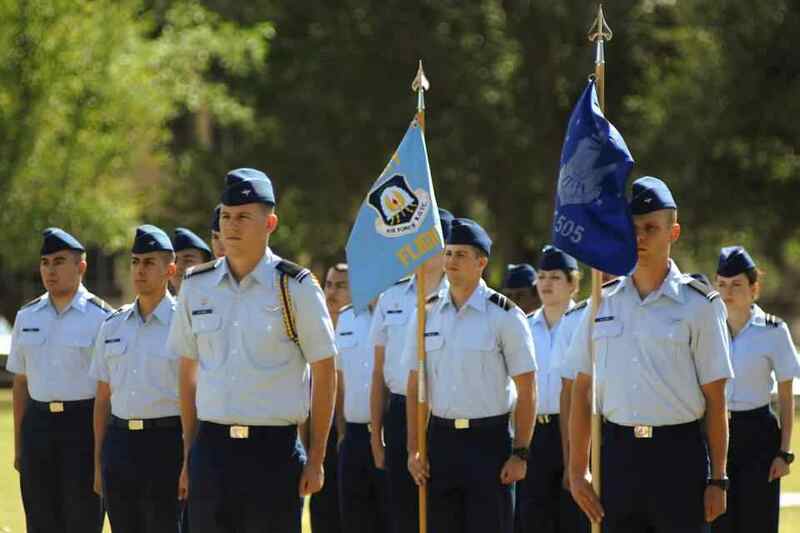 Photo (above) of Platoon of Colonel Cline’s Air Force Detachment 505’s Cadets was taken by NMSU journalism student, Rosemary Woller. This entry was posted in HOT NEWS! on April 27, 2015 by FASFRIC.